Last week I have the privilege of traveling with LiquidWater to Haiti to drill a clean water well. It was a fantastic experience. I’m still attempting to process what I saw and learned on this trip and how it will effect my life going forward. Today I want to share three things I saw in action that made me reflect on church leadership back home. Meet Real Needs in the Community. This picture is from the “dedication ceremony” last Thursday. School kids showed up and sang a few songs. People from the surrounding village came to check out what is going on. Politicians gave speeches (a global reality!). All this happened because this local church was meeting a real need . . . provide clean drinking water. As I standing under the palm tree drinking in this moment my mind flashed to my church and I found myself wondering what it would take for this happen in my community. What is a real need that our church could meet that would draw out capacity crowds to check it out? Evenore embodies that living a faith in Jesus can be full of joy! Not only was he amazing at manicures, and playing games, and leading silly songs with the kids . . . he was great at teaching the Bible. This is a powerful living lesson for the community to see. The good news should produce joy! It’s “good news” after all! Does our community see the church as a place of joy? More pointedly . . . do people see church leaders as positive, happy people? This photo was taken after we visited this family’s home. Every afternoon we’d spend time in the community praying for people. We’d take time to learn a bit about the families and ask them how we could pray for them. Then we’d spend a few minutes praying for them. How can our church offer more prayer for people? Rather than more tips on living or advice for dealing with situations . . . can we just offer prayer as a solution to people? What does our scalable prayer strategy look like? 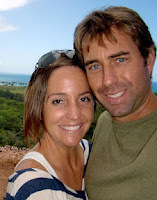 We were hosted in Haiti by Brandon & Jessica Stone. Check out their blog to learn more about them. They are servants of the Living God. They are kind and generous spirits attempting to serve in very difficult situation. In many ways they are pushing up hill against significant issues. I was humbled by them in many ways this week. I’m honored to count them as friends in the cause. I have much to learn from them. If you can support what they are doing in Haiti . . . please do. Rich – I felt like I was right back in Haiti looking at your pictures! I agree that Brandon & Jess are incredible servants. I can’t wait to hear more about your trip. I am so glad that you are presenting yourself as a learner and the Haitian church as the teacher. That is very honouring of our Haitian brothers and sisters! Thank you for that! These are great processing questions…….and bridges the experience you had in Haiti with Liquid Church at home. Meet Real Needs- The gratitude that the Haitians were showing at the well dedication probably as due to their deep sense of gratitude. It must have been so awesome to witness! Your great question raised a question for me. What would people in your church and mine be so grateful about that they wouldn’t want to miss the party that celebrates it? How can we foster attitudes of deep gratitude in our churches? Church can be fun! – At our church on Sunday, the teacher said that the 3 characteristics of the kingdom of God are righteousness, peace and joy!! We should be masters at story-telling in our churches- telling real life, current stories (testimonies) of righteousness, peace and joy!!!! People should come to our churches expecting to hear good stuff that God did the week before. And when we hear about what God did the days before…we should celebrate/party BIG TIME!!! Praying like it matters – Really good question….it’s making me think! [Orange 2012] Free Resources to Help Your Church!